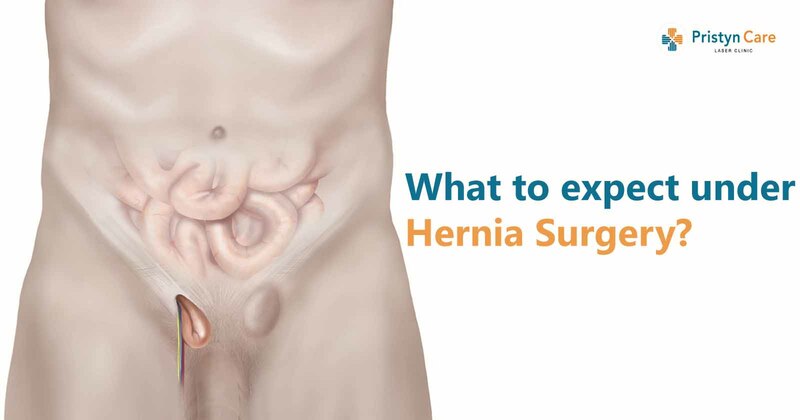 What to expect under Hernia Surgery? Hernia is an abnormal condition in which an organ or muscle tissue exits from a weak point in the muscle wall that holds it. This weakened area in the muscle layer is called Fascia. Strain and pressure on the muscles can cause tearing of the tissues that facilitate protrusion of organ. The major cause of factors contributing to hernia is obesity, recurrent constipation, frequent coughing, aging, injury, medical conditions such as cystic fibrosis. Hernia is classified as an inguinal hernia, umbilical hernia, hiatal hernia or a femoral hernia and incisional hernia). Depending on the area and the organ that spills out. However, its severity depends on its size. The mild protrusion can be treated with medication and precautions. But if the size of hernia rapidly grows, surgical treatment is the solution. The surgical treatment could be open or laparoscopic. Open surgery involves incision to locate hernia and pull back to its usual place. Laparoscopic surgery is comparatively less invasive. Also, it involves the use of cameras and small surgical instruments to perform the surgery. A mesh is used to support the weak muscles further to avoid recurring of hernia. This treatment must be performed by an experienced surgeon to avoid consequences as the surgery involves minimalist of details. In case the hernia patient has undergone a surgery before and has adhesions, hernia surgery must be avoided. In rare cases, this surgery may affect fertility in men due to injury in the vas deferens. Hernia in infants and children must be treated with utmost care by a qualified surgeon. It is important to note that hernia can become dangerous if left untreated. If you suspect a hernia, consult a doctor and diagnose your condition. Hernia can be diagnosed by physical examination, ultrasound, through barium X-ray or endoscopy depending on its type.